Uganda dubbed the pearl of Africa is number one wildlife watching destination in Africa and the country is blessed with four main national parks where visitors on Uganda safari tours can enjoy highly rewarding wildlife drives. Among the national parks include Murchison Falls- Uganda’s largest national park with the world’s powerful water fall. Queen Elizabeth national park also considered to be Uganda’s number one wildlife safari destination with the adventurous Kazinga channel, far Kidepo Valley National park-Africa’s most beautiful national park and Lake Mburo-compact gem in Uganda. Spanning on an area of 1978kms, Queen Elizabeth national park is the only Uganda safari destination with the highest recorded mammal and bird species. 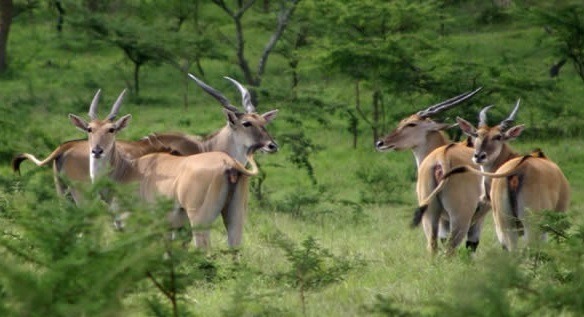 The park provides a wide range of opportunities for visitors on safari tour to Uganda to encounter the unique wildlife species such as the tree climbing lions in famous Ishasha sector, Buffalos, Crocodiles, and Hippos especially on the shores of Kanzinga channel, among other species. Franked on north western part of Uganda, Murchison Falls offers the opportunities of tourists on wildlife safari tours to Uganda to enjoy the views and sights of all the Big five wild game. But within the park, you have chance to enjoy the views of all the Big four wildlife i.e. Hippos, Lions, Elephants, Buffaloes and the other one is protected Just 122kms on the way from Kampala to Murchison Falls National Park in Ziwa Rhino Sanctuary . What makes Murchison unique from Queen is the presence of the White Rhinos, Giraffes which are not sighted in Queen Elizabeth National park. However at both parks, you are likely to encounter the elephants, buffaloes, hippos, bushbucks and Uganda kobs. Regardless of which national park you decide to visit while on your Uganda safari holiday, Uganda safari destinations will always offer you that golden opportunity to encounter the world’s exclusive wildlife species, Talk of the Mountain gorilla in Bwindi Impenetrable forest, Golden Monkeys in Mgahinga National Park and Chimpanzees in the world’s primate Capital –Kibale forest National Park.